You've probably arrived here from Dawny's blog and know exactly what to do by now! Just leave a comment on this post and you'll be in with a chance of winning this fabulous prize, a rainbow selection of ribbons, pins, buttons and charms. The blog hop closes on 7th August at 9pm UK time, when I'll be picking a winner. Now hop on over to Kath's blog for another chance to win. If you think you may have missed a blog, here's a full list of blogs taking part in the hop! Happy Birthday with the Ribbon Girl! Thanks for the chance to win some fab Ribbon girl goodies!!! Congratulations on your permanent design team spot Vicky, and well deserved it is too! Thanks for the chance to join in with The Ribbon Girls 1st birthday celebrations. 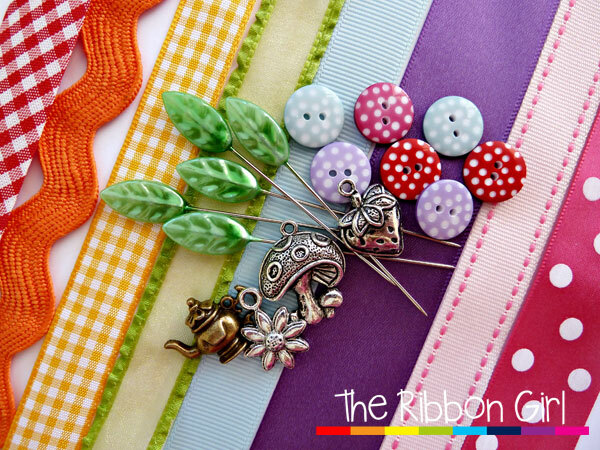 Congratulations on your DT appointment and thanks for the chance to win some delish ribbons,buttons and charms. Congratulations on becoming part of the DT! And Happy Birthday to the Ribbon Girl. Enjoying the blog hop - off to the next blog. Morning, this has certainly spread a little sunshine up this neck of the woods, on this grey wet Monday. 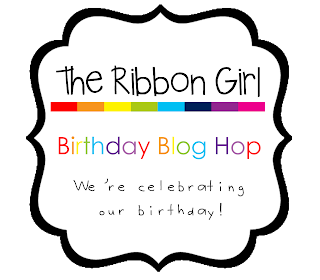 HAPPY BIRTHDAY Ribbon Girl, great hop :). Happy Birthday for the Ribbon Girl! Yayyy!! I love chances to win some gorgeous candy, especially when it's from The Ribbon Girl - LOVE the stuff!! Happy birthaday with Ribbon Girl! Morning Vicky.Thanks for the chance to win some lovely goodies. Mazzel Tov! with a sunny birthday of Ribbon Girl. Hi Vicky,Thanks for the chance to win some fab candy. Afternoon Vicky, thanx for letting us join in the birthday celebrations ang giving us a chance to win some fabby candy. Love your very pretty cards! Thanks for the chance to win the lovely goodies! Happy B-Day Ribbon Girl and thanks for this super giveaway!!! Hi thank you so much for the chance to win some lovely Ribbon Girl goodies - I love them!! Gefeliciteerd met de Ribbon Girl blog en je DT-lidmaatschap! Prachtige creaties maak je, hele mooi stel! Zie graag nog meer creaties te ge moed! Good Morning! 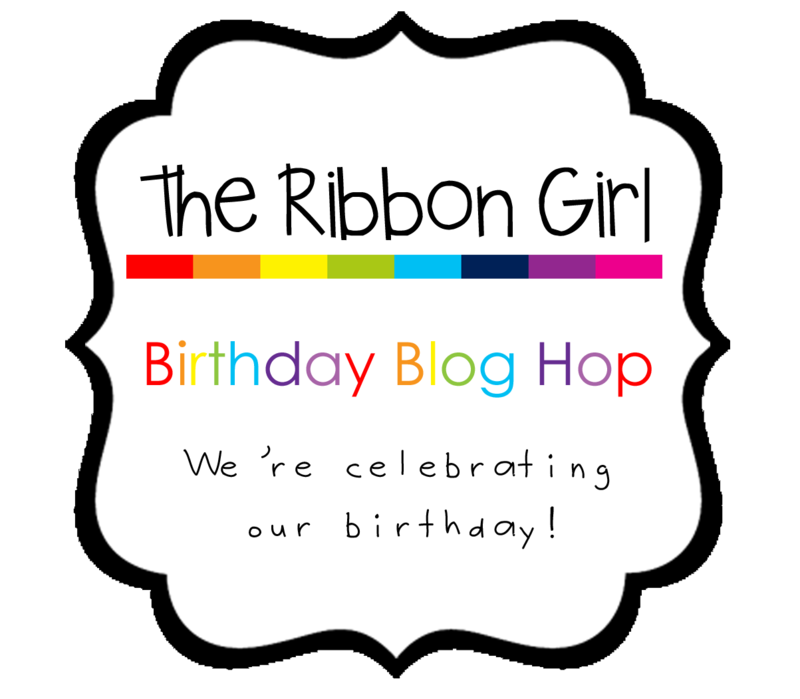 I just found The Ribbon Girl blog and your blog through the blog hop. Happy Birthday to The Ribbon Girl! Thank you for the lovely blog hop and the opportunity to join in! Good Morning and thank you for the chance to win goodies! Congrats on the permanent design spot! You make very pretty cards!Thanks for sharing! Congratulations yet again Vicky - what a wonderful DT to be on. Am sure you'll be amazing us all with your creativity with all that fab ribbon. Hello Vicky, happy birthday to the Ribbon Girl. Happy Birthday and thank you for the chance to win this great ribbon girl goodies! Congrats on making the Design Team permanently - am very pea green! Happy Birthday to all you wonderful Ribbon Girls. Thank you for the fab chances to win gorgeous blog candy. Many thanks for the wonderful inspiration that you all give us. Happy Birthday to the Ribbon Girl. Thanks for the chance to win. Hello Vicky, Happy Birthday to The Ribbon Girl x I just love the Sew Much card you made it is so pretty. Vicky, congratulations with this Ribbon Girl Birthday and thanks for the chance to win this candy. Goodmorning and happy birthday Ribbon Girl! What a wonderful bloghop! keep up the good work! Congratulations on you new position, and happy birthday to the Ribbon Girl! Thanks for a chance at the goodies! Tes créations semble si délicates. elles sont charmante. Happy Birthdag with the Ribbon Girl! What a great hop! thank you for the change to win beautifull prices. Wow Vicky what amazing things you create. Thank you for the chance to win some ribbon girl goodies. Happy birthday to the ribbon girl fab products and inspiration from the DT. Ps I am now a follower. Happy birthday! Have a great day and thanks for the chance to win. Hi Vicky, congrats on joining the DT at the Ribbon Girl. Thanks for the chance to win candy. I am loving this hop so much. Thanks for giving a chance to win. Congrats on the new DT spot!